Opposition is building against a Trump-administration plan to allow certain groups of protected Vietnamese immigrants to be deported, a day after The Atlantic reported that the U.S. is reinterpreting an agreement with Vietnam that shielded some of them from being moved out of the country. In the latest sign of growing worry over the efforts, a group of at least 22 members of Congress have signed a letter addressed to the White House, as well as the Department of Homeland Security and the State Department, to express “deep concern” over attempts to rework the 2008 accord between the U.S. and Vietnam. That deal protected Vietnamese nationals who came to the United States before July 12, 1995, and committed crimes, from the threat of deportation. That specific date, which was when Washington and Hanoi established diplomatic relations, covered those fleeing the Vietnam War. In essence, the Trump administration has now said it believes that the agreement allows for a wider number of Vietnamese migrants to be deported. “As a result, some made mistakes that funneled them into the criminal justice system,” they wrote in the letter, a copy of which was seen by The Atlantic. “We strongly oppose any renegotiation” of the deal “that strips the current protections afforded to Vietnamese refugees,” they wrote. Although many of these Vietnamese nationals had been ordered deported, the 2008 agreement prevented them from actually being removed from the United States. Dozens of Vietnamese nationals with felony records were being held in immigrant detention centers, some for six months or longer, according to groups that advocate on behalf of immigrants. Many of these people had already served time for their crimes, but the new rules raise the possibility that some of them will be re-detained. “I’ve been getting so many text messages from scared Vietnamese community members over the last few days,” Phi Nguyen, the litigation director for the Atlanta chapter of Asian Americans Advancing Justice, said in an email. The administration’s policy is its latest crackdown on immigration, which President Donald Trump has tied to a host of ills that afflict the United States. And because immigration policy is viewed by the courts to fall within the jurisdiction of the executive branch, it is unclear what, barring a change of heart in the Trump administration or resistance from Vietnam, opponents of the new effort can do. The White House maintains that it is only targeting people convicted of crimes. The reinterpretation would apply to undocumented Vietnamese migrants, or those who have been convicted of committing crimes, but would not apply to those who have become American citizens. 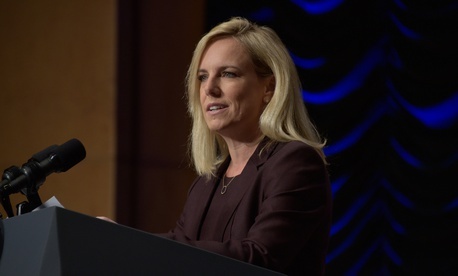 On Wednesday, a DHS spokeswoman said that the reinterpretation of the deal would cover about 5,000 people who were convicted of crimes during previous administrations.